Cohansey - Cross bedded quartz sand. Coastal conditions. micaceous, very coarse quartz sand Inner shelf conditions. quartz sand to a clayey, sandy silt. Middle shelf conditions. Vincentown - Massive quartz sand to a quartz limesand. shelf conditions. Cretaceous to Paleocene. 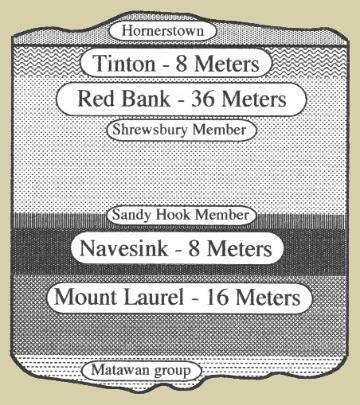 Mount Laurel, Navesink, Red Bank, and Tinton formations. For group information, see Monmouth group. Cretaceous. coastal conditions (youngest beds are total marine). marcasite / pyrite concretions, lignite (fossil wood) and amber. member, which is marginal marine). Navesink - Thick dark greenish- grey clayey glauconitic sand. Middle to outer shelf conditions. lignite. Inner to middle shelf conditions. micaceous sand. Inner shelf conditions. cross-bedded quartz sand. Coastal conditions. (fossilized wood). 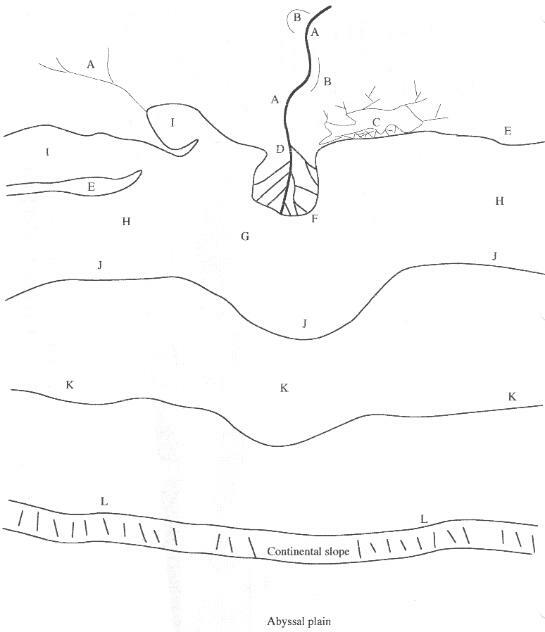 Inner (embayment type) conditions. micaceous silts and clays. Inner to middle shelf conditions. A. Continental fluvial (overbank / natural levee) - Raritan, Magothy. B. Continental fluvial (river fill / point-bar) - Raritan, Magothy, Englishtown, and Cohansey. C. Continental fluvial ("mangrove" swamp, marginal marine) - Raritan. D. Continental fluvial (flood basin) - Raritan, Magothy. E. Coastal (beach) - Magothy, Englishtown, Cohansey. F. Near-shore deltaic (marginal marine) - Magothy and Englishtown. G. Off-shore deltaic (full marine) - Merchantville. H. Near-shore marine - Mount Laurel, Red Bank, Vincentown, and Kirkwood. Hornerstown, Manasquan, and Shark River. 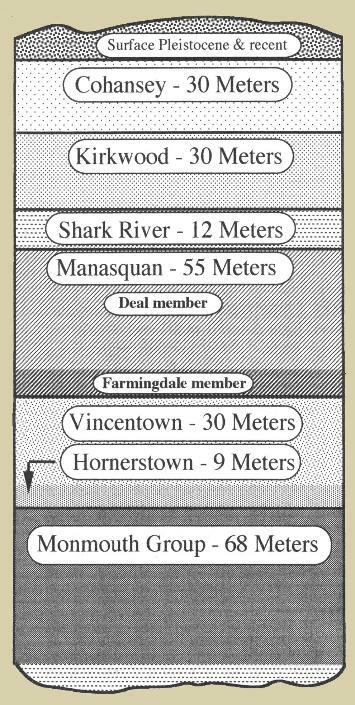 L. Outer-shelf (open marine) - Marshailtown, Navesink, Hornerstown, and Manasquan. M. Basement rock (subsurface) - Pre-Cretaceous formations.